On the Herentals-Bocholt canal, barges have to pass four locks within a distance of five kilometres. Plans to connect the Scheldt, the Meuse and the Rhine using canals had existed for centuries. The projects from the 15th to the 18th centuries were mainly intended to achieve military purposes, whereas the 19th-century developments were economically motivated. The execution of the plans was not always straightforward.De uitvoering van de plannen liepen niet altijd van een leien dakje. 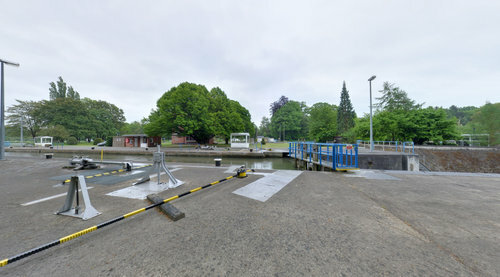 The geological layout Breuk van Rauw means that the Herentals-Bocholt canal has to deal with a water level difference of 15 metres within about 5 kilometres. Between the Blauwe Kei in Lommel and the canal junction no fewer than four locks are required to achieve this feat. The old locks, which are still operational, are gems of industrial archaeology.